Modern cars ride smoothly and handle excellently when new. Over time, as the miles add up the suspension components of your car wear out due to normal wear and tear. 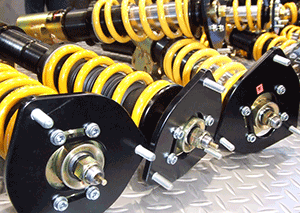 Shock Absorbers and Struts are the two main components that influence both the ride comfort and handling of your car. Essentially hydraulic cylinders designed to control the rate of collapse and expansion of your cars spring suspension systems eventually shock seals become dry cracking and dry rotting and can begin to leak. Strut cylinders can wear and eventually need replacement. Our experienced auto mechanics can quickly inspect your car and tell you if it’s time to replace your shocks and/or struts. Here at Bowe’s Exxon Car Care Center, we use the top brands of shocks and struts including Airlift, Bilstein, Fox Shox, KYB, Monroe, Rancho and OEM parts. Call us today to schedule an appointment to have your shocks and struts inspected and if needed we’ll replace them for you all in the same visit. We’ll help you maintain your cars smooth ride for the length of your ownership!